Bring an iconic Southern comfort food to your family kitchen! Don't worry about making dumplings from scratch or making a gravy with this no-stress, no-mess, all-included dinner solution. Quickly add the ingredients to your slow cooker before you leave for the day, and when you get home, just serve, sit, and savor. Big flavor families love, yet easy enough for a casual, weeknight dinner, this is sure to become a go-to meal. Just imagine your home filled with the aroma of mouthwatering, juicy chicken in a complex, flavorful broth accented with cream and sherry wine. 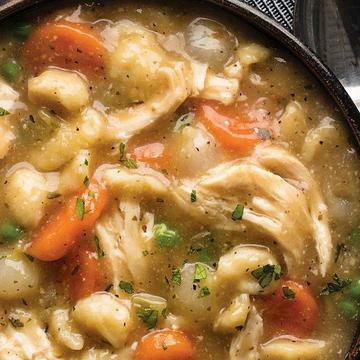 Along with hearty dumplings and colorful carrots, celery, onions, and peas, this meal is a comfort food that will satisfy even the hungriest groups. Instructions based on 6-quart slow cooker. Appliances vary; adjust cook time accordingly. Do not thaw. Keep frozen until ready to cook. Remove contents from box. Carefully open bag with vegetables and remove sauce pouches. Return vegetables and dumplings to freezer. Place chicken and sauce pouches under cold water to loosen from film. Open chicken pouches and place chicken in slow cooker. Wash hands thoroughly after handling raw chicken. Open sauce pouches and add sauce and � cup water to slow cooker. Cover and cook on LOW for 8 hours or HIGH for 4 hours. Without stirring, add vegetables and dumplings to slow cooker for the last hour of cook time. Stir and serve.